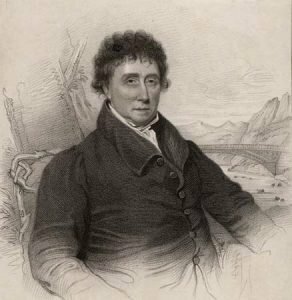 This month we’ve chosen to profile a world-renowned civil engineer and architect from Scotland; Thomas Telford, first President of the Institution of Civil Engineers, and known as the Colossus of Roads (see what his poet friend Robert Southey did there?) – a man who was hugely influential in his day and whose reputation as a truly great engineer has grown since. Telford was born in 1757 to an Eskdalemuir Kirk, Dumfries and Galloway, farming family. His father John, a shepherd, died shortly after Thomas’s birth leaving mother, Janet Jackson, to raise him in poverty. These humble beginnings drove Telford to achieve beyond expectations, initially training in stonemasonry as a young teenager, moving on to work in Edinburgh and then, in 1782, London where he began designing and managing building projects. In 1787, he was appointed Surveyor of Works in Shropshire and it was in this role that he started to make his name as a renowned architect and bridge builder, with forty bridges to his name in Shropshire alone. Telford is perhaps best known in Wales for his design of the spectacular Pontcysyllte Aqueduct over the River Dee in the Vale of Llangollen, pioneering new techniques for construction and manufacture, and which – as a part of the larger Ellesmere Canal project – remains a potent and very visible symbol of his vision. The aqueduct was designated a UNESCO World Heritage Site in 2009. During his later years, Telford was responsible for rebuilding sections of the London to Holyhead road; today, much of the route is the A5 trunk road featuring – on the island of Anglesey (Ynys Mon) – the crossing of the Menai Strait, his most formidable challenge. The famous Menai Suspension Bridge, spans 580 feet (180 m) and was the longest suspension bridge of the time. In 1801 Scotland, with the influence of his patron William Pulteney, Telford devised a master plan to improve communications in the Highlands, a massive project that was to last some 20 years. It included: the building of the Caledonian Canal along the Great Glen; redesign of sections of the Crinan Canal; some 920 miles (1,480 km) of new roads; over a thousand new bridges (including the Craigellachie Bridge); numerous improvements (including works at Aberdeen, Dundee and Peterhead); and 32 new churches. 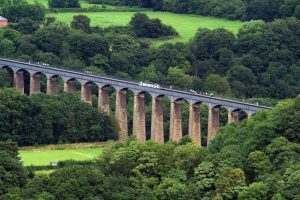 Telford also undertook highway works in the Scottish Lowlands, including 184 miles (296 km) of new roads and numerous bridges, ranging from a 112 ft. (34 m) span stone bridge across the Dee at Tongueland to the 129 ft. (39 m) tall Cartland Crags bridge near Lanark. Telford also constructed the Gota canal between Gothenburg and Stockholm, travelling to Sweden to personally oversee the more important initial excavations. Many of Telford’s projects, incidentally, were undertaken due to his role as a member of the Exchequer Bill Loan Commission, a body set up under the Poor Employment Act of 1817 to finance public work projects during a time of high unemployment. In 2011 Telford was one of seven inaugural inductees to the Scottish Engineering Hall of Fame. A truly remarkable man and innovative British Engineer. We salute you!